Kefalonia Greece Things To See And Do. 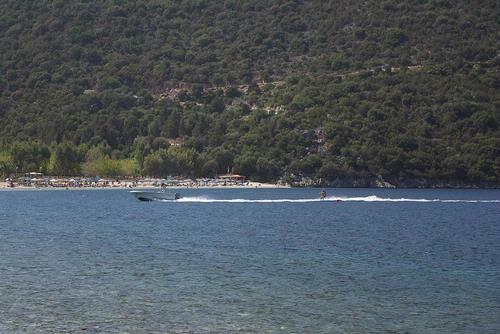 You can water ski at AntiSamos beach. The island offers a wide range of activities to suit all ages. Both day-hire and longer with or without crews available at Fiskardo, Lixouri.and Agia Efima. Daily and multi guided tours. Take a ride to visit ship wrecks, the Kava Reefs and the turtle beach, available from the beach at Skala. Day trips are available from Fiskardo and Agia Efima. Also cruises to the three islands of Levkas, Scorpios and Meganissi in glass bottomed boat with BBQ’s on a sandy beach. Snorkeling equipment is available for hire in Fiskardo. For beginers training under the supervision of professional PADI instructors. For certified divers a large range of dive sites including caves, caverns cliffs wrecks and night dives. It has been said that the world has a scale known only to those who walk. There is plenty for the keen walker to take in on Keflonia, with its coastal walks, towns, villages and mountian scenerey as well as a national park. There are several vineyards open to the public on Kefalonia. See Kefalonian wines page for full details.